DESCRIPTION: We are pleased to offer for sale this well proportioned four bed detached home situated in a popular residential area close to Gatley, railway station and motorway network. In brief the accommodation comprises, hall, two reception rooms, fitted kitchen, four good size bedrooms, bathroom and separate wc. Outside a driveway provides off road parking facilities and access to the garage. To the rear there is an attractive mainly lawned garden with paved patio area. Must be viewed!! LOCATION: South Park Road forms part of a mature, popular residential area situated approximately three quarters of a mile from both Gatley and Cheadle centres. Gatley and Cheadle both offer a good range of shopping facilities catering for most everyday requirements. In addition, the two John Lewis and Sainbury&146;s superstores can be found approximately one mile away, on the nearby A34 bypass. For the commuter, the North West motorway network and Gatley railway station are approximately quarter of a mile away. Excellent State and Independent Schools serve the area. DIRECTIONS: From our Cheadle office proceed along Gatley Road in the direction of Gatley. Turn right at the traffic lights and onto Kingsway. Turn first left into Coniston Road. Continue to the end of Coniston Road turning right on to South Park Road. The property can be found on the left hand side. ENTRANCE HALL 14' 9" x 5' 10" (4.5m x 1.78m) Stairs to first floor, laminate flooring, radiator, dado rail. DINING ROOM 11' 4" x 11' 7" (3.47m x 3.54m) Upvc double glazed window, brick built fireplace, laminate flooring, radiator. LOUNGE 14' 4" x 12' 0" (4.39m x 3.66m) Feature 'hole in the wall' gas fire, Upvc double glazed sliding doors opening to the rear garden, radiator. KITCHEN 11' 0" x 14' 3" (3.36m x 4.35m) Fitted with a range of matching base and wall units incorporating working surfaces, inset stainless steel sink unit, built in double oven and hob with concealed extractor above, plumbing for washing machine, Upvc double glazed window, tiled floor, radiator. MASTER BEDROOM 13' 0" x 11' 5" (3.97m x 3.50m) Fitted wardrobes and drawers, radiator, Upvc double glazed bay window. BEDROOM 12' 11" x 11' 11" (3.96m x 3.64m) Fitted wardrobes and drawers, radiator, Upvc double glazed window. BEDROOM 9' 8" x 14' 4" (2.97m x 4.37m) Two Upvc double glazed windows, radiator, laminate flooring. BEDROOM 7' 10" x 10' 6" (2.39m x 3.21m) Upvc double glazed window, radiator, laminate flooring. 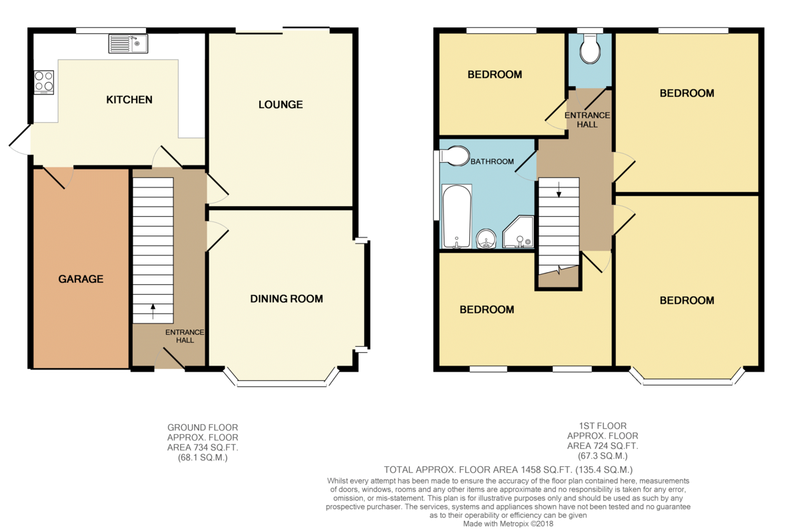 BATHROOM 8' 0" x 8' 0" (2.44m x 2.44m) Fitted white suite comprising panelled bath, low level wc, bidet, separate shower cubicle, Upvc double glazed window, tiled flooring, half tiled walls, radiator. SEPARATE WC. Low level wc, Upvc double glazed window, half tiled walls.